What a day in sports. As many of you probably know by now I am a huge tennis fan. Last year I was lucky enough to be in London during the finals of Wimbledon getting engaged, so I was lucky enough to miss the the 5 setter with Nadal taking out Federer. 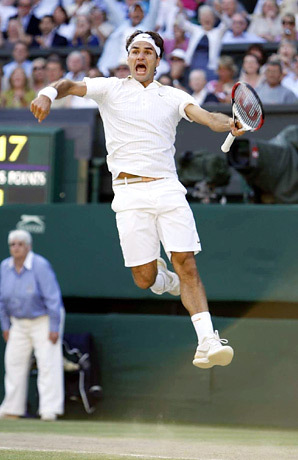 Today's match between Roger Federer and Andy Roddick was just as epic as last years match if not even more so. Watching Roddick hold serve for 4 straight hours without letting the best player of all time break him was beyond impressive. When the match was over I was excited that Roger had broken Pete Sampras most grand slam record of 14 grand slam titles but I also was feeling it for Roddick. The guy really gave it everything he had and to me it seemed like he deserved the win. When it is all said and done Federer continue to shows why he is the best player of all time. Another amazing Wimbledon final.